Hunters eagerly anticipate open season all year long. It’s their chance to reconnect with nature and live a true primal man versus wild experience, even if just for a morning. Hunting helps build self-confidence, carries on a centuries-long tradition, benefits conservation efforts, and improve survival skills. However, before stalking after a game, hunters should take certain precautions. Scented hygiene products can send off unfamiliar scents that forewarn wild animals and game. These products can also attract unwanted attention from insects. Thus, it is important for hunters to utilize items which address their needs without hindering their chase. Leading retailer of high-quality hiking and camping gear, Surviveware, is making a name among professional and amateur hunters. The company’s Biodegradable Wet Wipes are gaining popularity and commendation from long-time hunting enthusiasts. 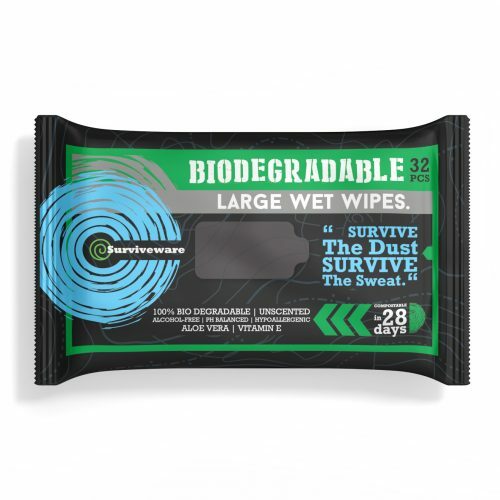 Designed for hikers and campers who are out on a day’s adventure, Surviveware’s biodegradable wet wipes are being sought by hunters for their unscented aspect. These wipes were created as a suitable alternative for providing freshness without having to step in the shower. These features were made possible through the company’s efforts to provide the best products and services to their customers. Each Surviveware Biodegradable Wet Wipe is made from 8” x 12” cloth. As each wipe is 30% larger than a typical wet wipe, an averaged-sized adult can thoroughly freshen up by using one to two sheets, depending on their level of adventuring and grime. It may take three to four cloths to achieve freshness for individuals who are extremely soiled from activities. Since it only takes up to a few wipes to get a decent clean, a pack of 32 wipes will last for quite a while and is more economical compared to the ones available in the market. Apart from its size, the sheets are made of a soft cloth material that glides smoothly on the skin. Surviveware is an advocate of eco-friendly products, which is why their wet wipes are biodegradable. The sheets will begin to decompose after 28 days. These biodegradable wet wipes are formulated to be gentle and safe for everyday use. Loaded with natural aloe and vitamin E, the wipes are packed with a moisture-enriched formula and are safe to be used by individuals with sensitive skin. Surviveware’s formulation makes it possible for the sheets to be tough on dirt, grime, and natural body oils, but gentle on delicate skin. Surviveware’s wet wipes are scent-free, so hunters don’t have to worry about unwanted attention due to their scent. The wipes dry nicely on the skin and don’t leave any sticky residue. Enjoy a hassle-free hunting trip with Surviveware Biodegradable Wet Wipes. Grab your batch and experience the benefits of having a reliable and dependable hunting hygiene buddy. Order these fantastic Biodegradable Wet Wipes today by clicking here.